Robin, Roxanne, and Debra taking a break before outside the convention center in Baltimore, before entering the fray. 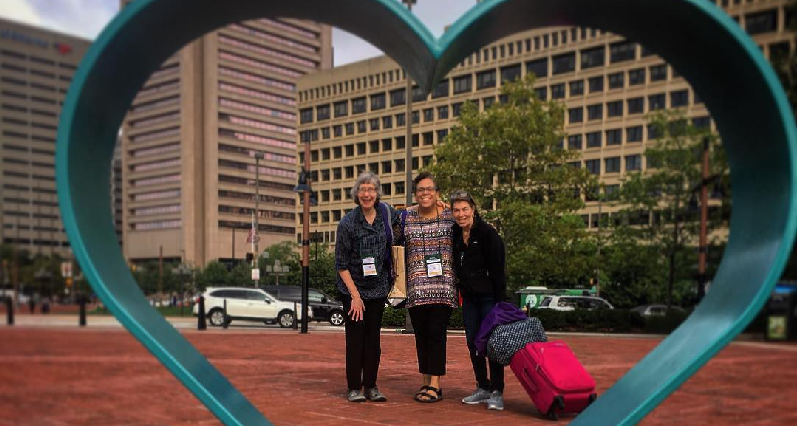 I attended this large natural products trade show in Baltimore with three staff members: Roxanne, who runs our kitchen; Robin, one of our supplement experts, and Meg who is in charge of our bodycare department, and we had a wonderful time. We were busy bees and came home jazzed up by conversations with other stores, new companies, and old friends from companies we’ve worked with for years. We found a CBD company with a CBD that Roxanne wants to put in lemonade. We came home revved up about using Lion’s Mane mushroom in the kitchen, too. In the supplement department we sell Lion’s Mane for mental acuity and nerve repair (I took it after my stroke 12 years ago, and I credit it for a large part of my recovery). Bass Brushes had a neat bright lime-green hair brush made out of a vegetable fiber that felt terrific in the hand, looked psychedelic, will last for about 5 years, and will sell for $6.99. Wait until you see it! There’s a waiting list for the product, so it will be some months. We heard a young woman from UMass, who started an organization called “Protect Our Breasts.” We want her to come to our store! Another speaker said that teens who switched to safe cosmetics had significant reduction of chemicals in their body after only three days. As new and exciting grassroots organizations continue to sprout up all over the place, we see on the flip side some of our old friends being swallowed up by Big Corporate. We have reason to hope. A lot of times, the new owners give the old management free reign. Sometimes, the new owners find themselves being pushed and prodded in the right direction… We remain skeptical a lot of the time. But we haven’t given up hope. An example of this? When Hormel acquired Applegate, they appointed a former Applegate exec their VP of Mission, and her job is, within Applegate, to change the meat we eat. For her that starts on the farm. She also told us that Applegate is now working with a different cheesemaker (which is why we can no longer get Applegate Havarti) called Kalona. Kalona, a cooperative that has been in business since 1879, does things the right way. Applegate’s VP of Mission says that rural America is the new inner city, and she and her team are determined to create a new food system that benefits everyone. We heard that Nestle started an incubator and is funding a think-tank full of young people to develop new food companies with passion and a social mission. [Editor’s Note: we are of course not blind to Nestle’s history as a less-than-ethical company, so of course we approach this new development with at least a little healthy skepticism]. We heard, and I’m sure you all know this, that inflammation influences everything in our bodies. That the Mediterranean Diet works better than statin drugs. That meditation works better than statins. We eat too much sugar and refined carbs, and, yes, those make inflammation worse. When our insulin levels rise, we gain weight. When insulin falls, fat is oxidized for fuel. High insulin levels make us hungry. Turmeric, and particularly curcumin, works for weight control because it works on inflammation. We found a company founded by two crazy poor Asians (that’s how they referred to themselves) from Singapore. They are working with stingless bees and have a line of medicinal, raw trigona honey with nectar from fruit trees. It tastes sweet-sour with notes of mango, coconut and pineapple. Medicinal like manuka honey, but unlike manuka because it is consistently infused with propolis due to the unique hive structure. From pesticide-free farms, this honey has a lower sugar content. We took a chance and ordered their products. And we ordered their activated pili nuts that are volcanic-grown, raw, wild harvested. Check them out at www.pilipushers.com. We placed an order for eco-ink kids’ stuff like coloring books, advent calendars, and more, that we’re very excited about. We hope you will be, too. We lined up some speakers for the store, artwork for windows, participants for our October 20th birthday party, and ordered products for stocking stuffers. I could go on and on about vendors and the show. We tasted lots of collagen products and loved one that was strawberry-lemonade flavored. We found a potato chip roasted with rice bran oil that tasted light and very crunchy. We met the folks from 24 Mantra Organics, an Indian company whose products we’ve introduced already. We met Belal, whose mission it is to provide traceable, high quality, sustainably-grown food at affordable prices. His company, The Real Co., works with people with disabilities. Every product sold feeds a child in need. Belal will be debuting his packaged versions of coconut sugar, Himalayan salts and basmati rice at our birthday party.